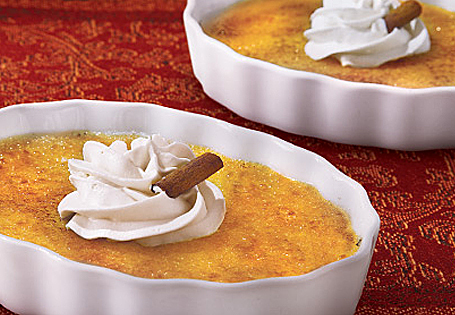 In a medium saucepan, heat the cream, eggnog, cinnamon, nutmeg, vanilla, brown sugar and 1/4 cup granulated sugar. Stir frequently to dissolve sugar and bring to a boil. Immediately remove from heat. Cool for 10 minutes. In a large bowl, whisk the egg yolks until frothy. Slowly whisk in cream mixture. Set eight ovenproof medium ramekins in 13x9-inch baking pans. Divide the custard evenly between the eight dishes. Add boiling water to baking pan to come halfway up the sides of the ramekins. Bake 30-45 minutes or until center is set yet still jiggles. Remove from water bath and let cool 15 minutes. When ready to serve, remove from refrigerator and cover tops in granulated sugar. Caramelize sugar with a kitchen torch or place under hot broiler for 1-2 minutes. Let cool 1 minute and top with whipped dairy topping.